Boy oh BOY, I’m so excited! I’ll start at my version of the beginning. Andy, my son-in-law, got my daughter, Ana, a purse for Christmas and asked me to wrap it. I confess I thought briefly about finding something else to put in the box, hoping that Andy wouldn’t notice I kept the bag for myself. 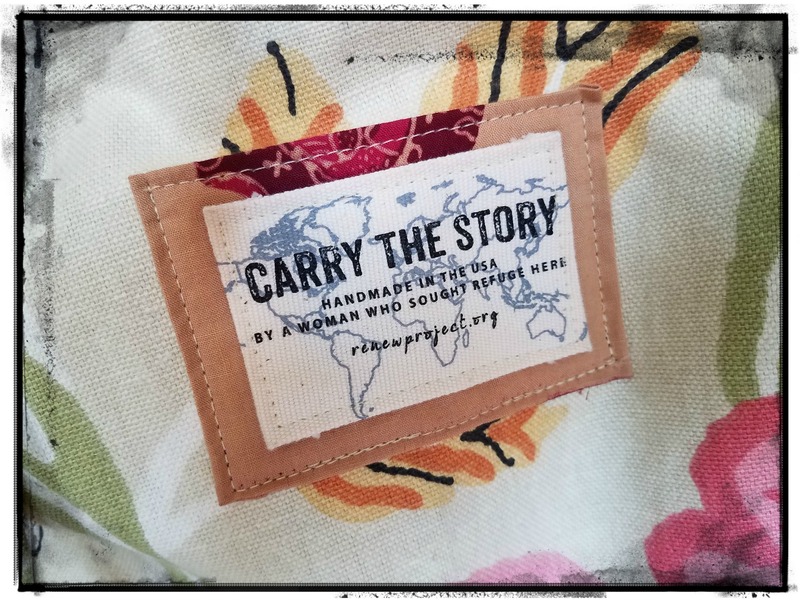 On the front of the bag, a small patch was appliqued: Carry the Story. And underneath were the words Handmade in the USA by a woman who sought refuge here. Good golly, Miss Molly. I was hooked. This little bag was made in Glen Ellyn, right there in a little shop on Main Street. The sewing studio is at the back of the store, open to the public, where women who sought refuge make a living for themselves and their families. Families who have run for their lives from situations so desperate, most of us will never be able to either picture or imagine. Situations so ugly or cruel or dangerous that these women and their families were willing to leave everything behind just to escape. Some of these women left professions of prestige and value. Some of them are educated at the post-secondary level and brought a wealth of ideas and wisdom with them to the United States. But language, connection, and wardrobe barriers have gotten in the way of finding positions worthy of their abilities. So they come to Re:new five days a week. Having learned how to use the powerful industrial sewing machines in the studio, these artisans work with their hands, make friends and quality products, and live a life they never expected – but for which they are grateful every minute. As I left my first ever meeting as an Associate Board Member of the Re:new Project, I thought how much these women deserve respect … how much they deserve a life of peace and contentment. As I said the word deserve in my head, a few bells went off and pretty loud. For in recent days, I have seen this word used so many times it has become like a drone in my ears. He deserves this or that because of his good – or rotten – behavior. She deserves something so much better because she is such a wonderful person. They don’t deserve a bad rap just because they made a mistake. It’s just wrong. We here in the First World take a lot of time and exert a lot of effort making sure that we – and all of the ones we love – are happy. We find what makes us happy. We get rid of what doesn’t. We expect it, we work toward it, and, when we have it, we take it for granted. Happiness. Being happy. Being free of misery and burden. We deserve it, don’t we? I’ve heard stories about families that fled the Rwandan persecution and genocide, starting over and making their homes in the United States with the help of compassionate organizations like World Relief. All I can think of when I hear Rwanda is the story told by an observer whose name I don’t remember, but whose words I’ll never forget. As an outsider, a member of one of the relief organizations, he told of how he witnessed countless and nameless, bruised and bloody bodies crashing down a river, getting caught in swirling currents, unceremoniously dumped there as victims of a sweeping wave of violence and hate. A force so ruthless, 800,000 Tutsis were killed in three months’ time, the result of a twisted sense of revenge by a majority being ruled by the minority, and a government-led insurrection encouraging neighbor to kill neighbor. I don’t know all of these Rwandan families’ stories, but I know that what they endured reached far beyond the inconveniences of a leaky roof or disrespect by a boss or colleague. I know that what you and I may consider unacceptable could be in the little detour category for these brave refugees. I know that running out of half-and-half, making my morning coffee wimpy and sad with only 1% milk, cannot compare to days without enough to eat or drink while sustaining a life on the run. I know that being assigned a queen room when we booked a king with a view of the Magic Kingdom – and booked it well in advance – cannot compare to sleeping on a cot, or even the floor, with a sense of dread and anxiety. Honestly, my lovelies, just writing these words leaves me humbled and ashamed of my own sense of entitlement. I hope and pray that my contributions to the Associate Board of the Re:new Project will in some small measure contribute to the comfort and happiness of a refugee woman who simply longs for peace and safety. I hope and pray that every moment I spend planning events or raising money or getting to know these admirable souls will enrich their lives – as I am sure they will enrich mine. I hope and pray the next time I grumble about an empty container of half-and-half or a room without a view I remember writing these words. I simply must not continue to feel deserving of happiness or safety or convenience or peace. And I hope and pray if – and when – I am confronted by sadness or danger or inconvenience or war that I demonstrate the same determination I see in the faces of those who have gone before and lived to tell their stories. The faces of these lovely women who sought refuge here. If you have any questions about the Re:new Project, please comment. I’d be honored to tell you more about what we have in the works! Next Post: Are you an expert? Very humbling to think about my complaints through out the day.